This pretty frilled brim hat is an ideal fashion accessory, it can be worn when shopping, going to the beach or just a general outing and will also keep the sun off your head. 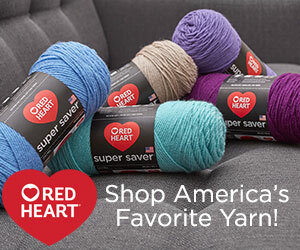 Made with 2 colors in worsted weight #3 yarn, using a 4.50mm hook, it’s soft and comfy on your head. Made in rounds without turning until the end of Round 1 of brim. 4th Round – (Inc Row) ch2, 2hdc in base of ch2, 1hdc in each of next 2hdc, * 2hdc in next hdc, 1hdc in each of next 2hdc, * rpt from * to * to end, sl st first hdc on beginning of round. (56hdc). # Join in color 1. 7th Round – ch2, 1hdc in base of ch2, 1hdc in each hdc to end, sl st to first hdc on beginning of round. 8th Round – Rpt 7th Round. Fasten off. Rpt from # to # until 18 rounds have been worked from beginning. Fasten off. 19th Round – Working in front loop of stitch only, ch1, 1sc in base of ch1, 1sc in each sc to end, sl st to first sc on beginning of row. Your work will appear frilled, but will fold in place after Round 2. Round 2 – Join in color 2 with a sl st to any sc, * work 1sc in each of next 3st (2sc, ch2, 2sc) in next st, 1sc in each of next 3st, sl st in next sc, * rpt from * to * to ast group, work 1sc in each of next 3st, (2sc, ch2, 2sc) in next st, 1sc in each of next 3st, sl st to first sl st on beginning of row. Fasten off. Finishing – Weave in and trim off loose ends of yarn, fold groups on brim over each other. 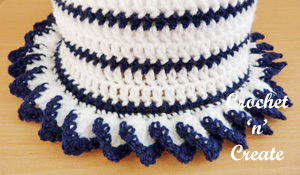 Hope you enjoy this free crochet pattern for a frilled brim hat, please can you pin it for others to see. The written instructions and pictures for this frilled brim hat pattern are copyrighted to crochet ‘n’ create © 2017. 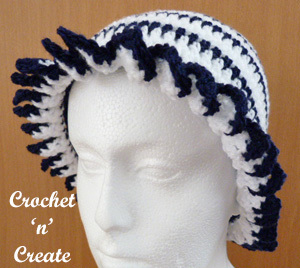 You are welcome to sell the finished products made from the free crochet frilled brim hat pattern, I just ask that you please use your own pictures and put a link back to crochet ‘n’ create. 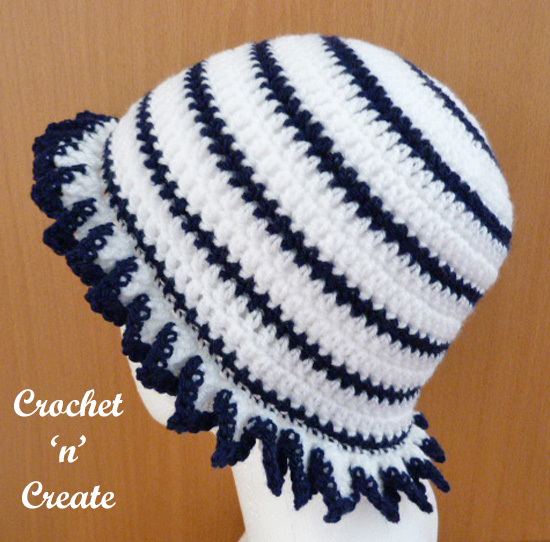 If you wish to share this free crochet frilled brim hat pattern on your social media or your blog please only use a direct link to the pattern page on crochet ‘n’ create. This entry was posted in beanie hat, free crochet patterns and tagged crochet, crochet hats, crochet sun hat, free crochet patterns on 29th August 2017 by crochetncreate. I think the Navy and white are elegant in this hat. I love it. Thanks Judy, I love these 2 colours.